b. 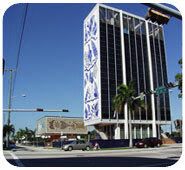 The prosperity of post-World War II America is reflected in the inventive designs of the Miami Modern style. The Miami Modern style evolved from Art Deco and Streamline Moderne designs, reflecting greater modern functional simplicity. Although the style was used on various types of buildings, it is typified by futuristic-looking hotel and motels. Characteristics include the use of geometric patterns, kidney and oval shapes, curves, stylized sculpture, cast concrete decorative panels and stonework depicting marine and nautical themes, particularly at the entrances. Overhanging roof plates and projecting floor slabs with paired or clustered supporting pipe columns, as well as open-air verandas and symmetrical staircases are also typical design features.